Ferric Chloride is a great substance! 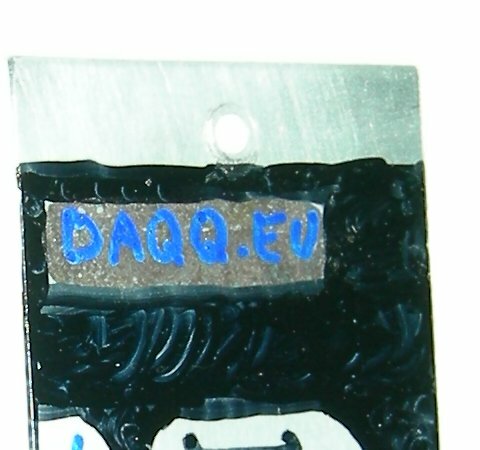 A lot of people have it, cause it is used to etch PCBs in DIY conditions. 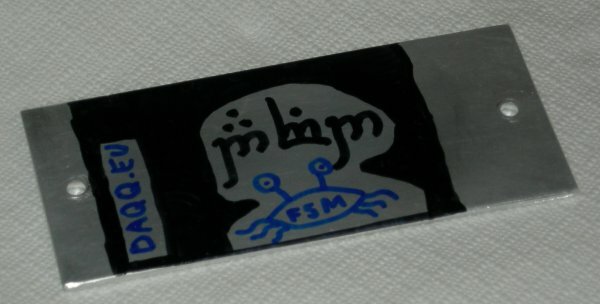 Aside from eating away copper, FeCl3 reacts with a lot of metals, but is harmless to most paints, even paint from a gel pen or a CD marking pen, or any alcohol based pen. 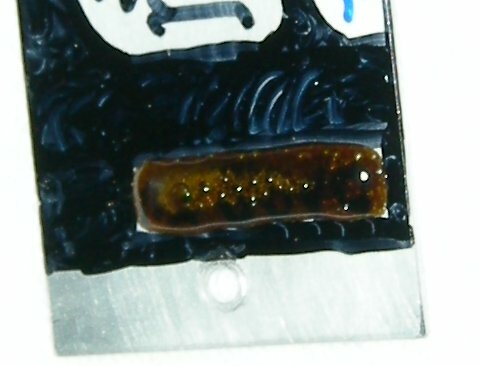 And that is used for making PCBs: you clean the copper plate of the PCB, then draw the artwork using such an alcohol based paint (from a CD writing pen, or any other). The process described here, is very similar, only it’s being applied onto aluminum. Aluminum reacts more violently with FeCl3 than copper. Hydrogen gas starts forming and the aluminum objects will get hot very quickly. I am NOT responsible for anything that may occur to you because of following this tutorial! You will follow this tutorial at your own risk!!! 0. Work with rubber gloves in a well ventilated space. Although not deadly, FeCl3 is still a chemical. 3. Get the ferric chloride. Go buy it somewhere, or get it by other means. HANDLE IT CAREFULY! Though it is not too dangerous, it still is a potent acid, and should be handled as such! To apply the acid I used a very simple wooden stick: first, I dipped the stick into a jar of the acid, then took it out. A small amount of the acid stayed on the stick. 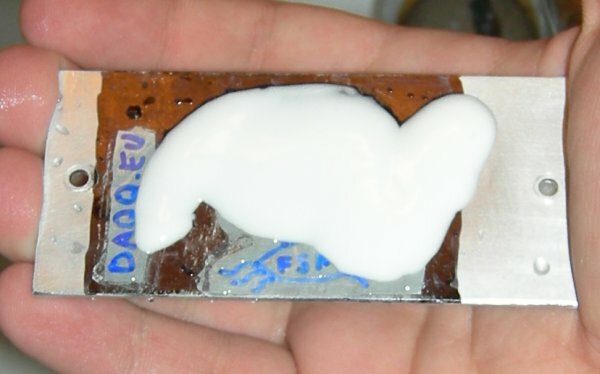 I toutched the surface with the stick, and it transfered all of the acid on it onto the aluminum. After that, wait until the reactions comes to a halt (approx 1 minute). You can see that by observing the bubbles of gas that are created from the reaction, as seen in the next picture. At first, there’s a few, then, there’s a lot, and in the end, the rate at which the bubbles are spawned is quite slow. Be wary, that the surface will be quite hot, because the reaction is very exotermic. Note on the bubbles rising: It’s hydrogen! DO NOT use anything around that might throw sparks! Hydrogen is extremely fun…erm…dangerous and explosive! After the reaction has halted, take a paper napkin, or a towel, and wipe all of the acid from the surface. Then clean it with water. NOTE: You must NOT put the whole aluminum object into any kind of FeCl3 bath! This could start a VERY bad reaction through out the whole surface, destabilize the paint and heat up very seriously!!! 6. Enjoy the wonders of your work! This is the result of scrubing the etched surface a few times. The brown stuff has been cleaned away and so has the CD marker paint. This entry was posted in Other, Projects and tagged chemistry. Bookmark the permalink. Ferric Chloride is NOT an acid! (I would not recommend sprinkling FeCl3 on your fries, though). It won’t eat holes in your skin but it WILL wickedly stain your skin and your clothing brown, so be careful, keep it off you and rinse it off quickly if you get messy. ferric chloride is acidic by nature though, this is due to the hydrolysis of the ferric ion. Ferric chloride etching solution is usually a mixture of ferric chloride and an acid – usually sulfuric but can also be hydrochloric. It is a strong acid! It is a salt, yes, but it is actually also an acid since it has low pH when solved in water (which is the definition of an acid). The difference compared with sodium chloride is that when hydrochloric acid is combined with sodium hydroxide (giving a sodium chloride solution) the acid and the base cancel perfectly, but if you use ferric hydroxide instead the hydroxide does not completely dissolve in water, so some of the hydrochloric is left, and the result is acidic. We are talking roughly 1% hydrochloric, for a pH of about 1.5, so it is much weaker than the really strong stuff, but also considerably stronger than, say, distilled vinegar or lemon juice.